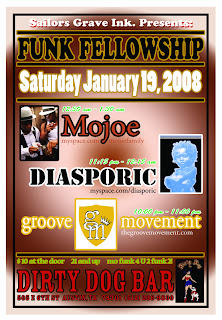 From the clam chowder giving me a stomach ache department... Mojoe, Diasporic, and The Groove Movement @ Dirty Dog Bar on Jan 19th! Mojoe, probably my favorite group at the moment, will most definitely tear it up. Haven't been able to catch them live, I can't wait. I wonder when their new cd comes out? Just got back from a pretty funny movie, Juno. Yes it's a chick flick, but at the same time it's a bit Napoleon Dynamite-esque. Juno is a story about a 16 year old girl who becomes preg and forced to deal with adult decisions. Classic growing up movie. Easy Lee (Charles Peters) and Tre (Treson Scipio) are MOJOE, a duo that has often described itself as The Roots meet OutKast over dinner with Marvin Gaye at DAngelos house. Thats a party that anyone in their right mind would want to attend, a free-form jam with only the tastiest beats, rhymes, and harmonies, not to mention words and emotions that truly echo the barometer of urban life. MOJOE channels that spirit with Classic.Ghetto.Soul., a timeless showcase of its sumptuous blend of worldwise poetry, sweet soul melodies and harmonies, reverent blues and jazz, and Dirty South hip-hop.